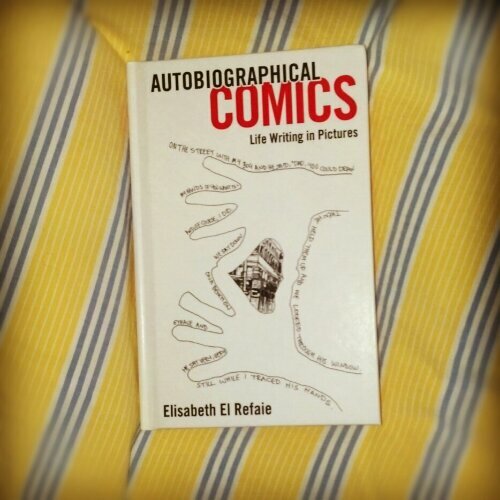 I just got “Autobiographical Comics: life writing in pictures” by Elisabeth El Refaie, a senior lecturer at Cardiff University in the UK. It’s an academic book that discusses the work of lots of different artists (including me). It’s thrilling to be discussed alongside r.crumb, Marjane Satrapi, Joe Sacco, and Art Spiegelman. Coolest of all : it uses a drawing of mine from Everyday Matters as the cover art. Wow! How cool is that!?!?! Congrats. As the French say: ça roule pour toi! Couldn’t happen to a nicer person. OOOOO, Danny! This is way cool! Merry Christmas! What a marvelous recognition! Your work is a beacon of hope in this troubled world! THat is an honor. Congratulations. The cover looks fantastic. I recognized your art on the cover immediately! Happy for you!! How fun, Danny! I recognized your drawing right away…Jack’s tiny hands. Congratulations! What a fabulous cover for what sounds to be a really interesting book. Well done you for getting included in it…. and some!!! I have just about every book you’ve been involved in or written and I love them all (A Kiss is on my christmas list). Unfortunately though I think this one will have to be ordered from the library….I live in the UK…. Amazon UK’s price on it is almost £50 (about $90)…. a lot more than Amazon.com is selling it for. But I can wish can’t I? Congrats! What a special honor for you! Next time you’re in New York, I’ll buy you a cup of tea. What a lovely thought…I’ve never been to NYC…someday!